Professional real estate agent, R’Che Feon Danley, is a dedicated agent with many skills. R’Che graduated from Northern Illinois University with a bachelor of arts in English literature. She then continued her educational journey to DePaul University, where she earned a master of arts in writing, rhetoric, and discourse. Yes, R’Che is a lover of words. She has helped many with writing in genres from books to business. Outside of her studies, she built her professional career. R’Che has 10+ years of experience in marketing and communications. 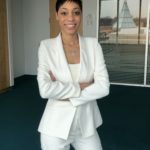 R’Che has helped businesses improve their communication reach through different social platforms, improve their employees’ writing skills through different business genres, and improve their overall brand through her creative ideas and strategic plans. She has not only been a part of teams but built and managed teams throughout her professional career. R’Che decided to combine her marketing, writing, and managing skills with her love for real estate. Being a Chicago native, R’Che has had the opportunity to live on every side of Chicago from the far south side, to the inner city, to the western suburbs. Living in different styled properties, embracing the different communities, and learning from different cultures, helped R’Che to experience all the amazing things Chicago has to offer from its’ properties to its’ people. To date, R’Che combines her experience and expertise to her evolving real estate business. Not only does R’Che help dreamers write their views and leave their legacies, but she also helps them to invest in their legacy by way of homeownership. Currently, R’Che is a professor of rhetoric and composition, president of The Write Views, published author, and your professional real estate agent. When R’Che is not working on growing her real estate business and teaching rhetoric, she enjoys mentoring and tutoring individuals in real estate and rhetoric and volunteering within her church and community. R’Che values the needs of others and is dedicated to ensuring their needs are met. Allow R’Che to help you invest in your legacy, by serving your real estate needs in buying and or selling.